Felicity Smoak comes to Central City for a visit, but Barry will have little time to enjoy it even after he escapes Iris' misguided attempts to play matchmaker. A cold, calculating bank robber named Leonard Snart is after a rare Khandaqian gem and he never gives up once he sets his eye on a target. Showcase #8 (Captain Cold's first appearance), Superman: The Movie (Barry's line about train travel being safe) and more classic The Flash comics than anyone could name but mostly Geoff Johns' run on The Flash (Johns did quite a bit to develop Snart as a character and co-wrote the script for this episode). 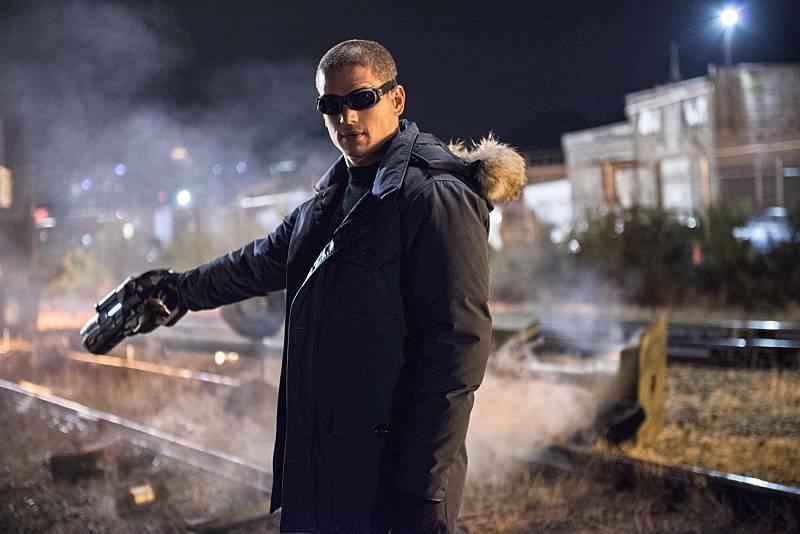 Wentworth Miller nails the character of Captain Cold, as written by Geoff Johns. Cool and controlled, but not without a thief's code of honor (no killing cops or guards unless they threaten you first, no harming women or children EVER) and some sense of humor (his treatment of the one boy during his tour of the museum). If this casting and writing is a sign of things to come with this show's casting, the future is bright indeed. The special effects in the train-crash scene are easily the equal of those utilized for Quicksilver in X-Men: Days of Future Past. As the episode opens, Barry is testing his ability to multitask by playing ping-pong with Cisco, chess with Dr. Wells and the board game Operation with Caitlin... all at the same time. Leonard Snart, as presented here, is almost precisely as he appears in the original comics, at least in terms of personality, intelligence and background. At one point, Barry chuckles about the name Leonard Snart and says it's nearly as bad as Bartholomew. Barry's full name is Bartholomew Henry Allen. As in the comics, Snart was the son of an ex-cop, who was an abusive drunk who beat his wife and children. At one point, Snart mentions a grandfather who used to take him to a crummy diner with a great view. In the comics, Snart's grandfather was his one positive male role-model and he did indeed take a young Leonard to many different places along his route as an ice delivery man. He also always bought Leonard and his younger sister ice cream. As in the comics, Snart begins planning how to stop The Flash after one of his robberies is thwarted by Barry Allen. However, in the original comics, Snart was caught and began plotting his revenge while in prison. In the original comics, Snart read up on kinetic energy and thermal motion while in prison. When he was paroled, he broke into a lab and stole everything (including a miniature cyclotron) he needed to build a gun capable of slowing molecular motion himself. The show, more realistically, has Snart stealing a weapon capable of slowing The Flash down rather than developing it himself. In the comics, Captain Cold wore a blue and white fur costume with a hooded coat along with a pair of skier's anti-glare glasses. His uniform on the show is similar and maintains the same blue and white color scheme with a fur-trimmed hood and anti-glare goggles. For the record, Captain Cold's weapon of choice is a freeze ray. Not an ice beam. That's so Johnny Snow. Who knows nothing. The curator at the Central City Museum who contacts Joe is named Dexter Myles. In the comics, Dexter Myles is the name of the curator of The Flash Museum. The gem Snart is after comes from the country of Khandaq - a Middle-Eastern nation in the DC Universe, best known as the homeland of the Shazam villain Black Adam. Harrison Wells knows who Felicity is and indeed had considered her as a potential recruit for STAR Labs. Felicity asks if Barry could run so fast that he would crumble to dust inside his costume. This is actually what happened when Barry died saving the multiverse in Crisis On Infinite Earths. The man Captain Cold is speaking to at the end of the episode is named Mick. Given the references to playing with fire, this is probably Mick Rory - the man who eventually becomes the super-villain Heat Wave. Surprisingly, Cisco's talk about temperature and speed being opposites is accurate and the explanation he gives regarding how a gun that can slow molecular motion could freeze things solid is taken straight from the comics. The Freeze Ray gives Barry a third degree case of frostbite and we're told that if it weren't for his accelerated healing factor he would have died. Cisco's Freeze Ray is powered by a compact cryo-engine that can achieve Absolute Zero. Barry: (off-camera, while running on his treadmill) Wanna see how fast I can run backwards?! Caitlin: Don't worry. He heals fast too. Leonard Snart: Once the armored car called 911 we had 182 seconds before any cop could be on the scene. No one could get there fast enough to stop us. But something did. And you lost your cool. You know the rules, we don't shoot guards or cops unless it's the only option. We don't need the heat. Felicity: Just go! Stay safe! And I'm talking to air now, which is just weird. And I'm still doing it! Captain Cold: (pause) You want to end up like that door? Felicity: Remember when you told me you had a little experience, liking someone who didn't like you the same way? That was Iris, right? Barry: How did you know? Felicity: It's the little things. The way you linger on her when she isn't looking, the smile you fake to play the part. The quiet dreams you keep to yourself. Barry: Like you and Oliver. Takes one to know one. I'm afraid it will change everything. Felicity: It will, but maybe that's not such a bad thing? What is wrong with us? We are perfectly perfect for each other. Barry: Yet we're sitting here pining for people we can't have. I guess what they say is true. Opposites do attract. Felicity says she learned about Barry's secret identity by listening in to his and Oliver's conversation from F101/A301. Caitlin tells Felicity that it's nice to see her again. It was revealed in A219 that Felicity, Caitlin and Cisco all met when Felicity came to visit Barry at STAR Labs while he was in a coma. Barry mentions the metahuman villains Marton (F101) and Nimbus (F103). Perfect. Absolutely perfect. The introduction of Captain Cold is perfect. The drama between Felicity and Barry is perfect. Easily the best episode of the series so far.